I have collected here for you 17 of the strangest sea creatures I have ever laid eyes on. Why 17 you ask? I started out with 10, but I keep running across more strange fish to add to my collection! Give me a few months and I'll have an encyclopedia-sized project on my hands. So, check back often - you may catch something new and strange from the depths of the ocean. 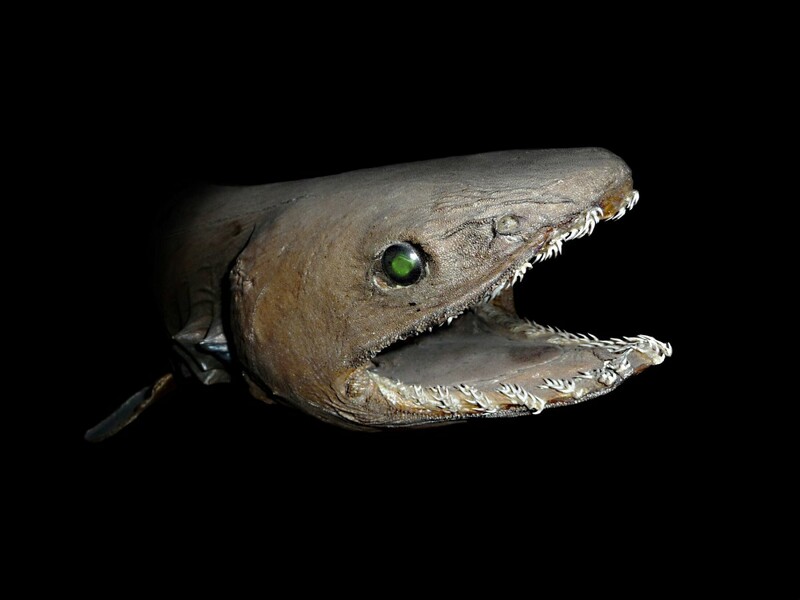 This odd fellow belongs to the chimaera family which includes other oddities like ratfish and rabbitfish. 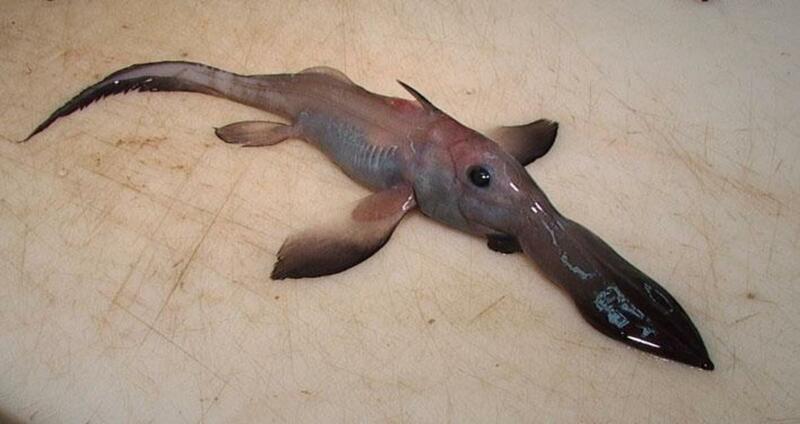 Longnose chimaera are found in warm waters world-wide, in waters from 200 to 2,000 meters deep. Its first dorsal fin stands erect and has a mildly toxic spike protruding from it. Like its close relative the shark, the long-nose chimaera's skin is smooth and scaleless. 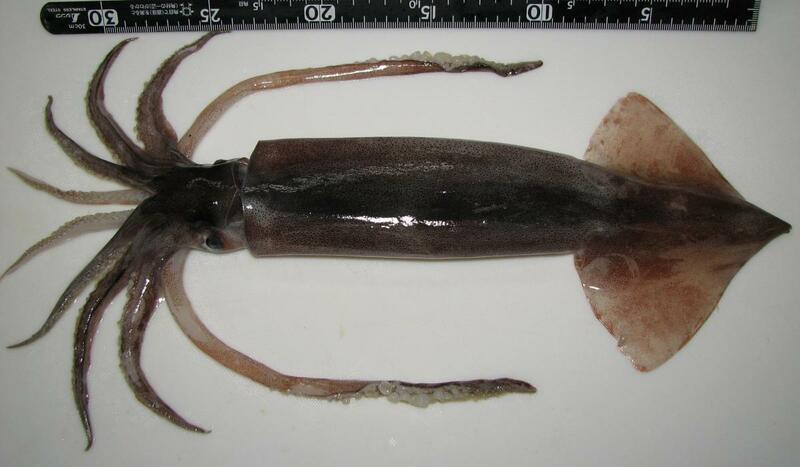 Todarodes pacificus, the Japanese flying squid, live in the northern waters of the Pacific Ocean. The flying squid lives only one year, dying soon after mating and spawning. The females are much larger then the males, and will grow up to 50 cm long. The Japanese flying squid propels itself above the water by filling its body with water, then shooting it out rapidly. The squid can attain heights of 65 feet, and can cover a distance of 150 feet by using their fins as "wings." Yes, this an actual sea animal, not a plant. Actually, it is a lot of little animals stacked together to form a long plume. 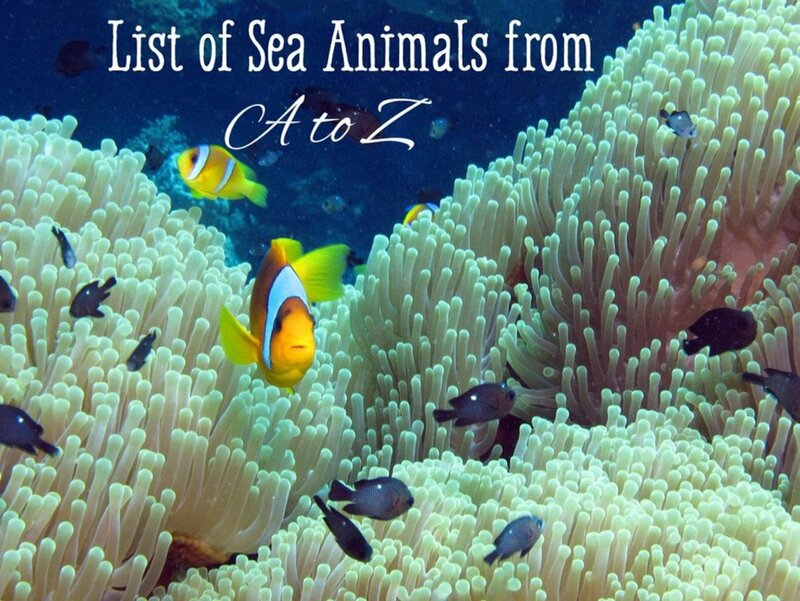 These sea animals are members of the cnidarian family and they prefer deep, calm waters. 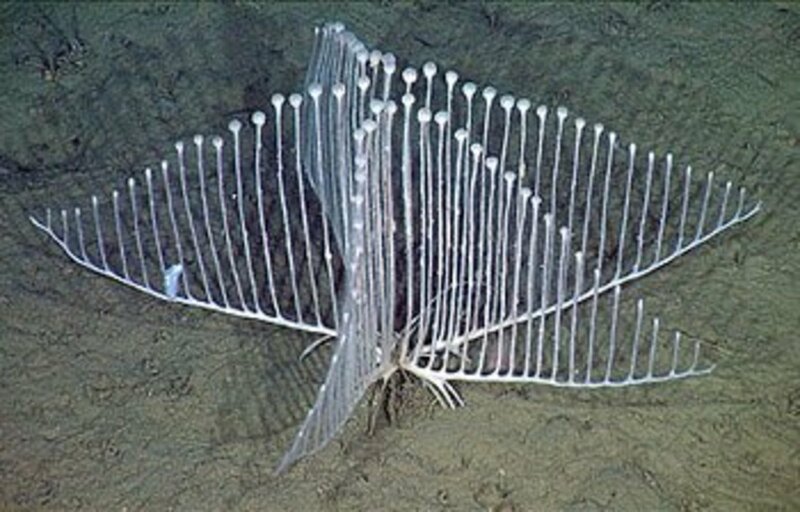 When food becomes scarce, the purple sea plume is able to detach itself from the sea floor and move to a location with plentiful food. 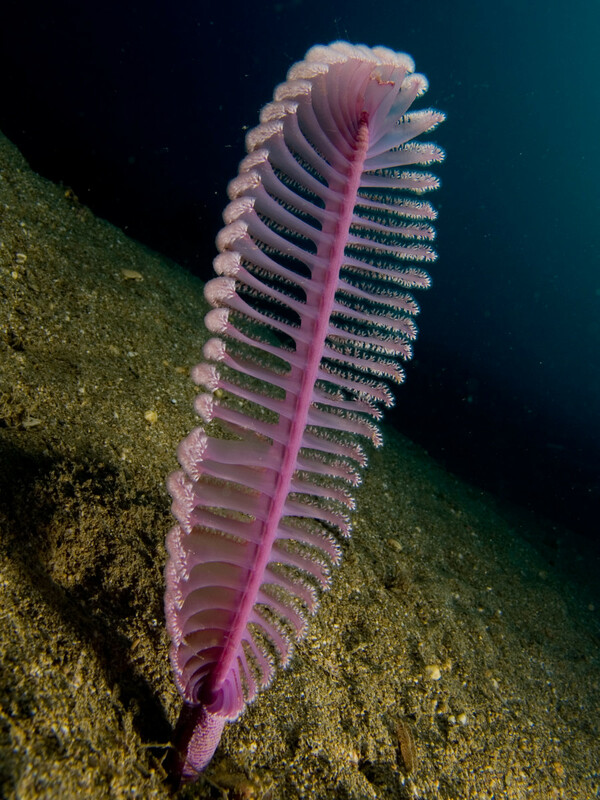 When threatened, the sea pen will emit a flash of green light. They can also shoot a strong stream of water at a predator to scare it away. 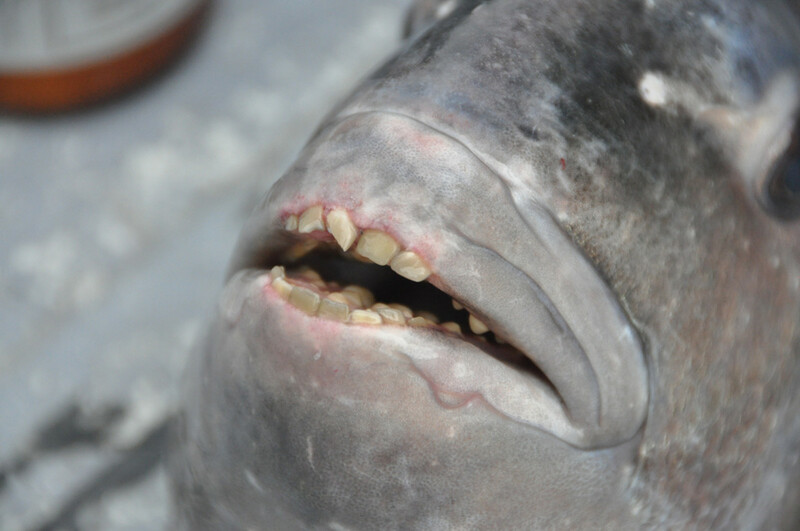 Those aren't bad dentures - those are the actual teeth of a sheepshead fish caught off the coast of North Carolina. No one knows for sure why it is called a sheepshead, though some people think the fishes head resembles - well, a sheep's head. Sheepshead are a popular sportfishing catch with has tasty flesh. They are primarily found in the off-shore waters of the Gulf of Mexico and the southern Atlantic Ocean off the east coast of the US. Sheepshead evolved their many rows of molar-like teeth so they could grind up and eat their favorite foods - bivalves and mollusks. The deep dwelling barreleye fish is found in the Atlantic, Pacific, and Indian Oceans. It gets its name for its large keg-shaped eyes. 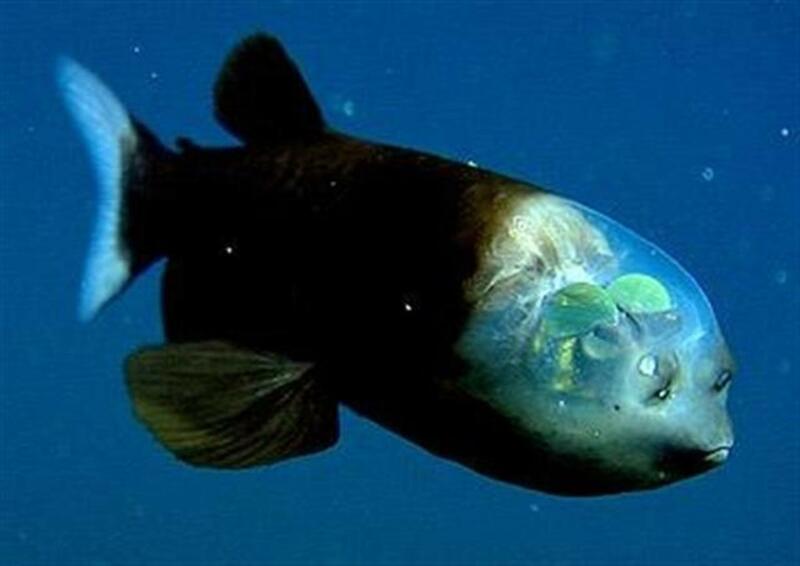 The skin of the barreleye fish's head is completely transparent, covering the eyes which are embedded in the gelatinous tissue. What looks like eyes on the face of the fish are actually its nostrils. The barreleye fish spends most of its time looking up for the shadows of prey, though it can rotate its tubular shaped eyes forward if needed. It is generally is found only in very deep waters. The barreleye fish is also known as the spookfish because of its bulbous eyes. If you look at the picture where his eyes "should" be, the barreleye fish resembles Caspar the friendly ghost. Scorpionfish are a class of venomous fish that includes the stingfish, dragonfish, lionfish, and others. They are bottom=dwellers that can be found in tropical and temperate waters around the globe. 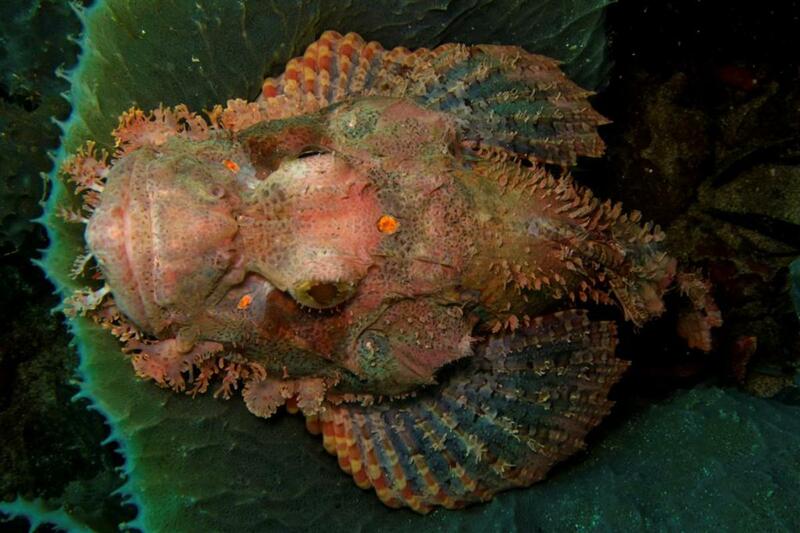 To repel predators, glands at the base of the scorpionfish's sharp-spined fins exude a mucous which is venomous. Scorpionfish "gulp" their food by creating suction with their mouths and gills. 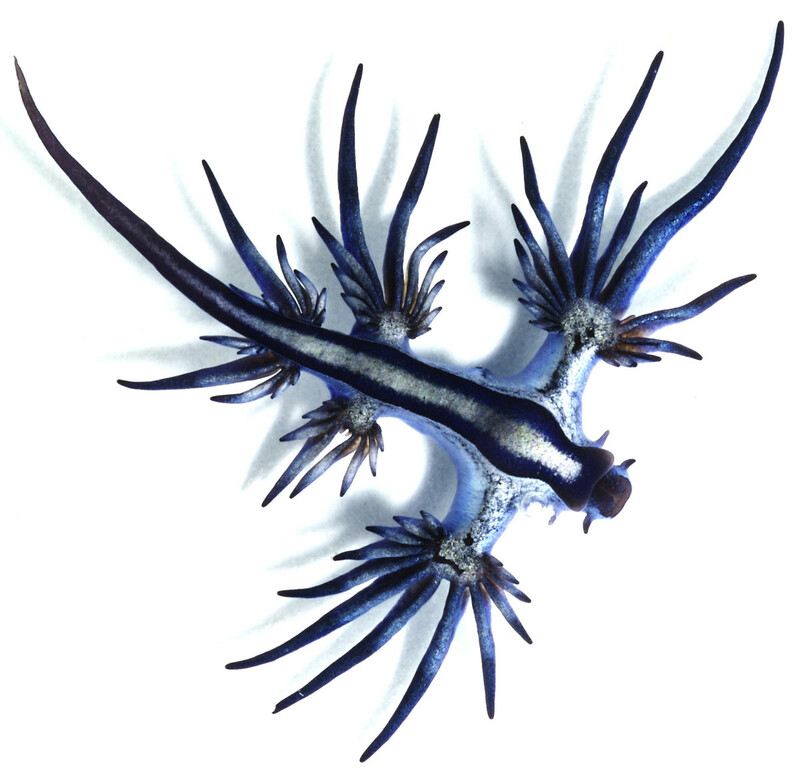 The blue dragon, Glaucus atlanticus, is also known as the blue sea slug, sea swallow, and blue ocean slug. It is a nudibranch, a member of the mollusk family. This little beauty grows to approximately 7 inches long and lives its life floating upside-down. It swallows an air bubble to keep it from sinking, and then drifts along where ever the currents take it. The blue dragon feeds on the Portuguese Man-of-War and other jellyfish. The blue dragon ingests the jellyfish poison, stores it in its cerata (finger-like projections off its body) and then uses it as protection from predators. Clever! 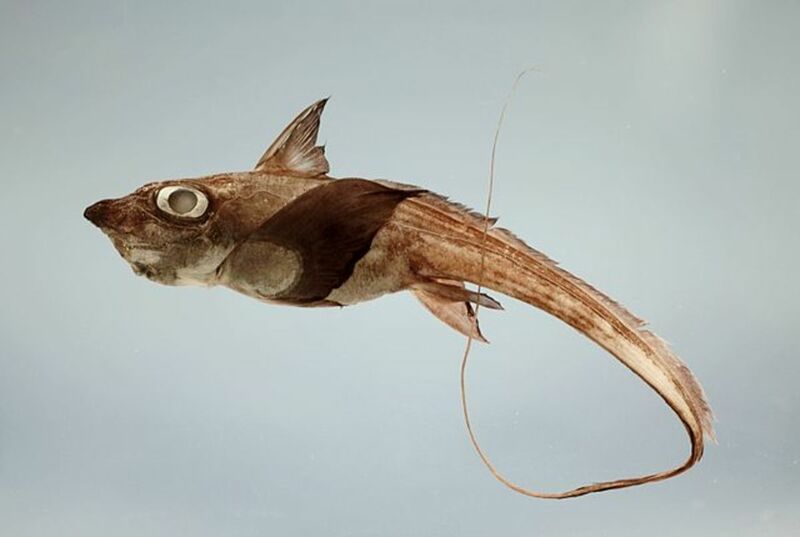 The shortnose chimaera, also known as a ratfish for its long thin tail, is found in temperant and tropical waters. 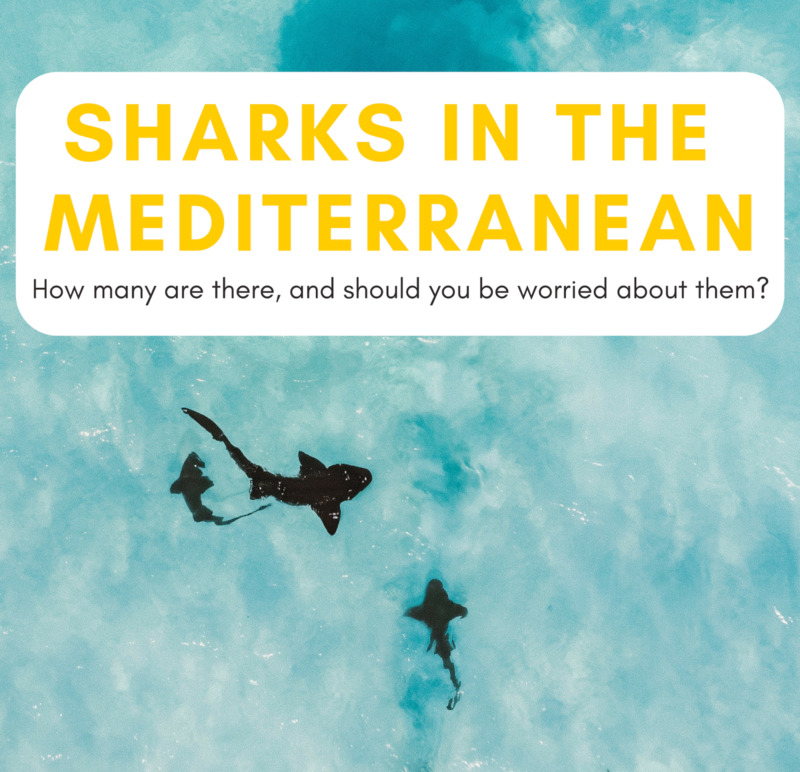 They are related to sharks, but have the characteristics of both bony and cartilaginous fishes. Some scientists believe it to be the link between the two types of fish. The rat fish has a venomous spine on its back, and certain species can grow over 4 feet in length. It is a bottom feeder and is not a tasty food source for people. Found in the waters around Australia, these fancy animals have developed leaf-like frills to hide in seaweed. 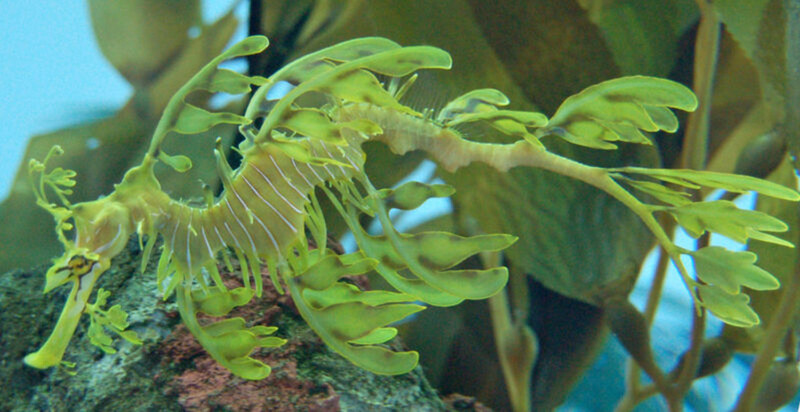 The male leafy sea dragons carry the fertilized eggs on an area near their tail, tending to the developing eggs until they are hatched. And you thought Venus flytraps were plants and only found on land. 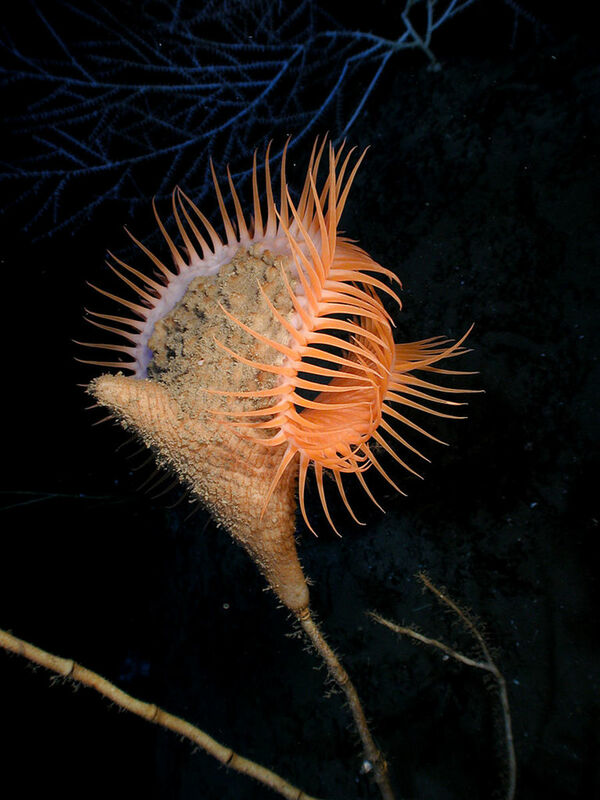 The Venus flytrap sea anemone, an animal classified scientifically as Actinoscyphia aurelia, is found in muddy areas in underwater canyons in the Gulf of Mexico and occasionally off the coast of Africa. Unlike the terrestrial Venus flytrap, the ocean dwelling version does not have a stem. It will crawl up any available surface so it has a better chance of catching its food. Once on a "stem" the anemone will generally stay put, though the young anemones tend to be more mobile than the adults. The Venus flytrap anemone can grow up to a foot across. When it is threatened the Venus flytrap anemone can close its "mouth" and emit a bioluminescent mucus to deter predators. The giant oarfish, also known as the king of herrings, is found in all seas but the coldest ones. It is the longest of all the bony fish. The giant oarfish pictured here measured 23 feet long and weighed in at 300 pounds. It was discovered washed up on shore near San Diego, California. The longest confirmed oarfish was a whopping 36 feet long, although there are unconfirmed reports of oarfish over 50 feet.The average oarfish grows to about 10 feet long. The video is of a giant oarfish that was caught by a fisher off the coast of England. The Blob Sculpin is a species of North Pacific fish which lives in the deep sea. It eats mollusks, crabs, and sea urchins. The blob sculpin's scales have spikes on the end for protection. 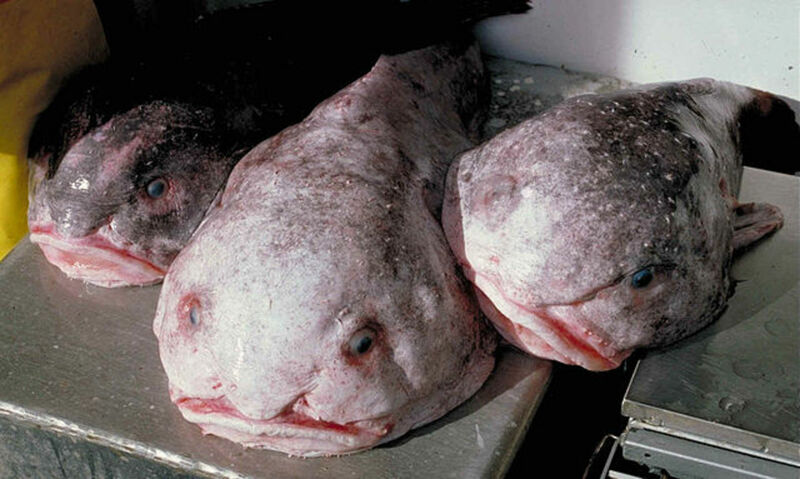 The male blobfish guards the eggs after the female lays the eggs on the ocean floor. These fish look like elderly gentlemen without their dentures in! 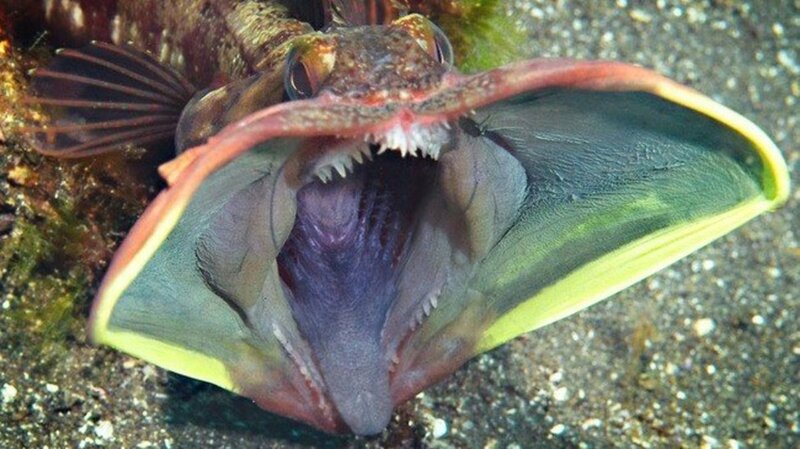 This wild looking fish is found in warm waters around the world. There are many varieties and colors, and some frogfish can change colors. 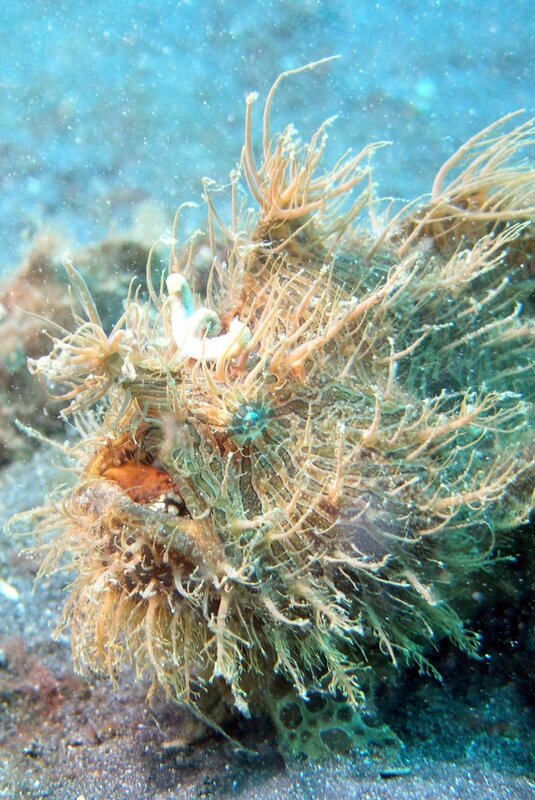 The frogfish has a worm-like appendage on its head which it uses as a fishing lure. When its unsuspecting prey gets close enough, the frogfish gulps it down. The frogfish can use its fins to "walk" along the ocean floor. They look like some sort of weird mutant toy dog walking on the ocean floor. 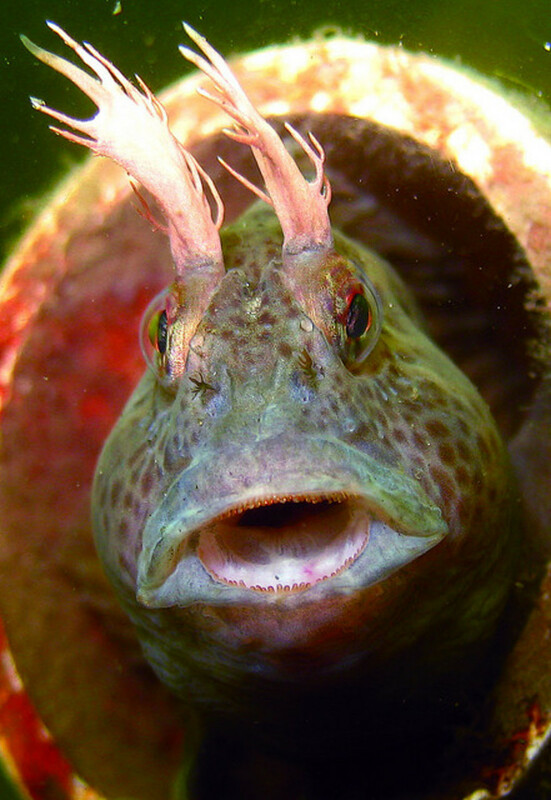 Blennies are little fish with big attitudes. They will attack much larger fish who dare to encroach on their homes. Rarely exceeding three inches in length, these fish are bottom dwellers. A territorial little fish, this feather blenny is found in the warm tropical water of the Atlantic Ocean. I'm not sure if its head fins look more like feathers or reindeer antlers. Jellyfish on a stick is a good description of these animals. These clear creatures are siphonophores, relatives of jellyfish and sea anemones. Like the jellyfish, they propel themselves through the water by forcing water through their bodies. 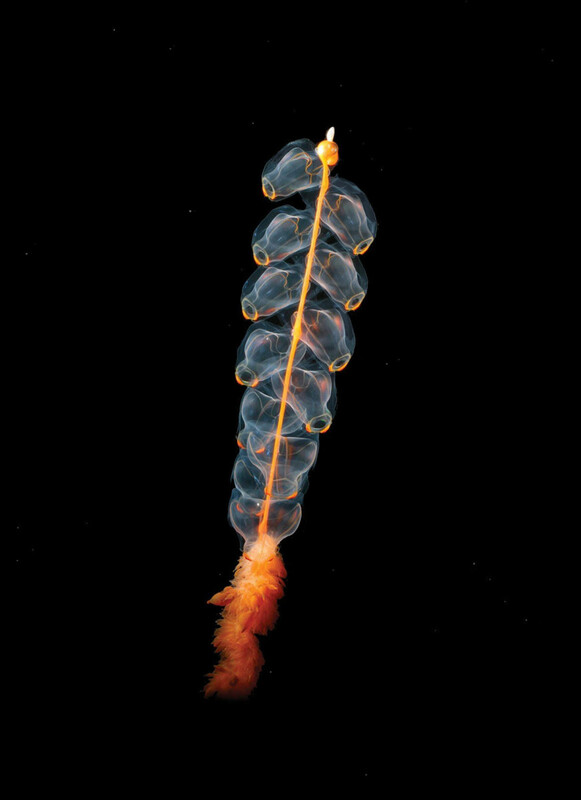 This clear column is actually a collection of creatures which are clones of one individual siphonophore. The Marrus orthocanna attach themselves together and share a long feeding tube. 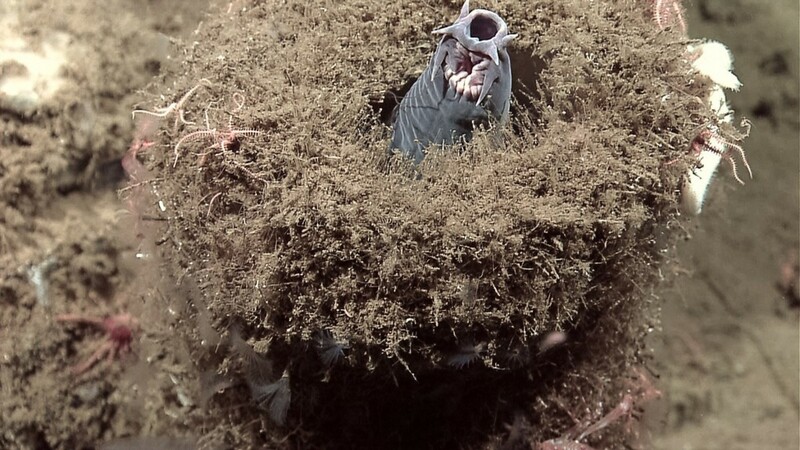 The colony will grow to 6 feet long, and has tentacles 20 inches long which they use for snaring fish to eat. Siphonophores have been found at depths of 6,000 feet, though they are more commonly found at depths of 2,000 feet. 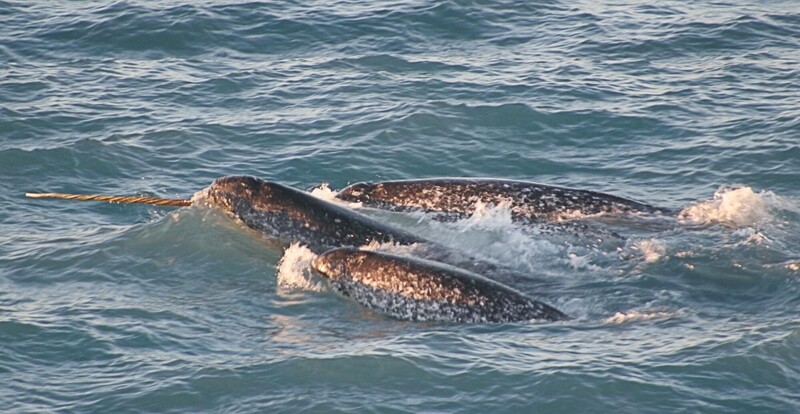 They are cold water animals and are found in the Arctic and Pacific oceans. 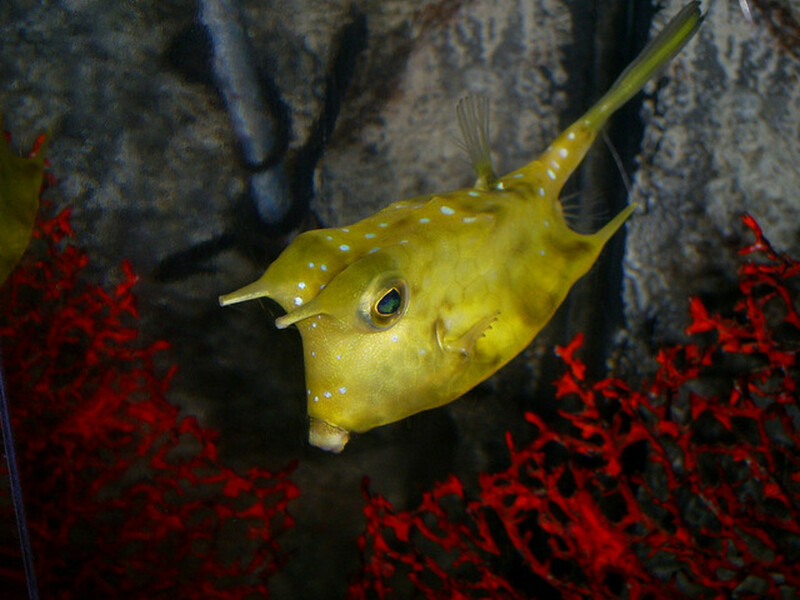 A member of the boxfish family, the long-horned cowfish has "horns" which resemble those of the legendary Texas breed of cattle. The cowfish can be found in the warm Indian and Pacific ocean water. It may be hard to believe, but the little fish pictured here will grow to almost two feet in length. This shark is found at depths of 250 meters or below in the Atlantic, Pacific and Indian Oceans. Known as the "living fossil", the goblin shark is extremely rare and reclusive. It has rarely been photographed since its discover in the 19th century. The goblin shark is the last of the Mitsukurinidae line of sharks which can be traced back 125 million years old. Male goblin sharks can grow up to 10 feet, females slightly smaller. Pictures do not properly showcase the creepiness of the goblin shark. The shark in the video bears a striking resemblance to the creepy e.t. in the movie Alien. Learn all about the ocean from National Geographic. Strange thing off the waters in Florida and nobody can figure out what it is?? What a great collection of bizarre sea creatures! It makes me wonder what mysteries we have yet to uncover on Earth and beyond. Gable, congrats on HOTD! You're right. 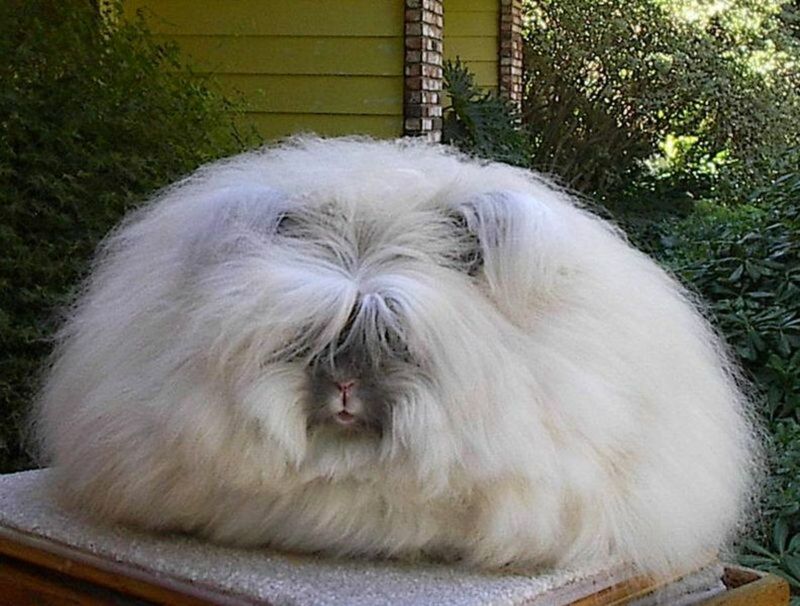 This is an odd collection of weird and ugly animals. Though I do love the feather blenny and the purple sea pen, which is the coolest in my book.